Facing "Dubaification" a few years back, officials and planners in Amman, Jordan, decided to take the city in a different direction, protecting its historic vistas while boosting residents' sense of community. Image via Roobee. That’s the principle behind Amman, Jordan’s, “Amman 2025” master plan (PDF). And the city is moving closer and closer to achieving its vision of livability, in spite of the odds. 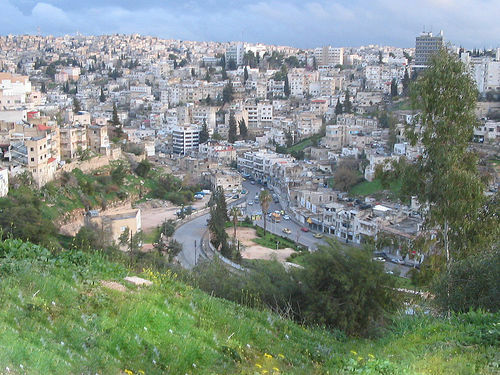 Concerned about the direction of Amman’s development, Mr. Maani worked with the Greater Amman Municipality (GAM) on the city’s master plan, Amman 2025, which was released in 2006. The plan won the 2007 Town Planning Leadership Award, and its success spurred GAM’s creation of the Amman Institute for Urban Development (Ai). The Institute gathers architects, urban planners, designers and social scientists who work to restore — not reinvent — the ancient city, which dates back to 8500 B.C. Meanwhile, their website is anything but antiquated. It features links to projects related to Smart Growth, Walking, Zoning, and SLUMLab, with information about their efforts in these areas. And you can interact with the organization on social networking sites like Facebook, LinkedIn and Flickr. New sidewalks and benches are discouraging “islands of privilege,” fostering interaction among different socioeconomic classes in areas that were becoming exclusively upper-class. They are also breaking down gender barriers in the predominantly Muslim city. Women who say it would be culturally unacceptable for them to hang out on the street or sidewalk say that now, with the new pedestrian plazas and sidewalk benches, it’s normal for them to spend time on the street. In the meantime, the planners from Ai see their projects as a means of empowering citizens who too often feel ignored by the government. They give local residents surveys about projects, and Gerry Post, the Canadian founder and president of Ai, trained the team to hold community meetings. In this city, where many residents from other parts of Jordan congregate and make their homes, Ai projects are developing a new sense of community and citizenship. Construction has officially begun on the city’s new bus rapid transit (BRT) system. The system will eventually run along three lines within the city: Mahatta to Sweileh (15 kilometers); Muhajireen to Sports City (7 kilometers); and Mahatta to Customs Square (nearly 8 kilometers). High-capacity buses will carry 120 passengers each, stopping every three minutes. Soon, Amman will join Tehran and Istanbul in the elite group of Middle Eastern cities with BRT systems. At a ceremony celebrating the start of construction, Mr. Maani said, “Citizens will feel this progress in all aspects of public transportation,” noting that the BRT will discourage car use, helping to create a new culture of public transit, which will also lend itself to improved sidewalks and public spaces.